china through the window of the pre-wedding photography industry. Matrimoni cinesi super lussuosi Arrivare al matrimonio scortati da un bel corteo di 30 supercar ridipinte di rosa, con labbroni in gommapiuma rosso shocking applicati sul cofano? When she visited China for the first time in 2004, Australian-born photographer-turned-director Olivia Martin-McGuire fell in love with its “pioneering spirit and upbeat pace”. A decade later she found herself living in Shanghai with her husband and children. Over the course of four years in the city, Martin-McGuire became fascinated by love and romance in Chinese society – in particular the phenomenon of the lavish pre-wedding photos. In 21st century China, it's custom for bethrothed couples to spend small fortunes on glamorous portraits, taken months in advance of their wedding. China Love invited viewers on a tour of this weird and wonderful world. Olivia Martin-McGuire, director of the China Love documentary, believes Chinese people are now displaying their wealth because it hadn't been possible in the past, particularly for people who lived through the decade-long Cultural Revolution. Media Stockade is a fine documentary company which focuses on social issues without allowing preaching to take over true filmmaking. China Love is a hoot in the cinema. Outrageous at the onset, but ultimately poignant, China Love pulls back the veil on the titular nation’s wedding photography industry, which at last count generated billions of dollars annually. That is an astounding figure, all the more so considering no such industry existed four decades ago, an era in which marriages were typically arranged and photographs were verboten. Director Olivia Martin-McGuire profiles several couples living in modern-day Shanghai to gauge the full effects of this relatively new phenomenon. Some of them have impending nuptials, while others married during the Cultural Revolution five decades ago or even further back in time. If you've seen the film Crazy Rich Asians, you will know that some couples spare no expense when it comes to having the finest wedding. China Love begins by fastidiously documenting the phenomenon of elaborate pre-wedding photography in modern-day China. We’re introduced to dozens of brides-to-be shot in unbelievable gowns surrounded in unbelievable settings. We witness elaborate underwater setups, shots where couples are made to seem like they are floating in air, and every kind of fantasy made real. The film immediately springs to life, aided by bouncing editing, upbeat tempos—I thought of the kinetic energy of box-office smash Crazy Rich Asians. A must for any newly engaged Chinese couple is the pre-wedding photo shoot. A marked break from the austere, purely functional weddings of the generation who grew up in the shadow of the Cultural Revolution, this multibillion dollar industry is the ultimate display of romance, status and wealth. Take a trip through modern-day Shanghai following couples on their crazed quest for the perfect photos. It’s a fantasy ride of glitz, excess, glamour and love. Perhaps the most emotionally effective part of the documentary, which recently played DOC NYC, deals with a nonprofit that provides photographic memories to the generation of couples who lived during the Cultural Revolution of the 1960s. These couples — including one that has been married for 69 years — apply the makeup, put on the dresses and hold their loved ones with great affection. The resulting photos will bring a tear to the eye of the viewer. The customs may not be liked by everyone who has to go through them, but real love makes its way through the flashbulbs and extravagance. Host Cyrus Webb welcomes photographer, director and producer Olivia Martin-McGuire to #ConversationsLIVE to discuss what led her to want to tell the story that is i the film CHINA LOVE and what it's been like to see the response. Contemporary engaged couples in China are now putting on the ultimate display of romance, status and wealth as they embark on their quest for the perfect photos. Their fantasy rides of glitz, excess, glamour and love are being highlighted in the new documentary, ‘China Love,’ which was directed and produced by Australian filmmaker, Olivia Martin-McGuire. In honor of the movie premiering in the U.S. this Friday, November 9 at 7:45pm ET at Cinepolis Chelsea in Manhattan, as part of DOC NYC, ShockYa is premiering an exclusive clip from the documentary. Set to enjoy its U.S. premiere as part of DOC NYC on Friday, November 9, China Love takes a look at Chinese culture through the lens of pre-wedding photography (?!). On initial blush, it sounds like quite a narrow focus; however, Olivia Martin-McGuire's documentary goes wide, encompassing the changes that have swept through China over the past few decades, and how that's affected its citizens. Now weddings are known for sucking up huge amounts of cash, but couples in China are taking it to an entirely new level. That’s according to Olivia Martin-McGuire, an Australian photographer who became intrigued by China’s billion-dollar pre-wedding photography industry while living in Shanghai for four years. Her film debut, China Love, is an empathetic take on how the country’s tumultuous history since the Cultural Revolution has influenced its present day. China Love producer on seeing China through the colourful lens of the pre-wedding photography industry. Your wedding day is meant to be one of the most magical days of your life. It’s a day that many of us have dreamed about throughout our childhoods and have been looking forward to for months. But for couples in China, there’s actually one day far before the wedding day that’s more important. The day of their pre-wedding photo shoot. She was at The Bund in Shanghai, and had arrived early. The director of the Australian documentary Red Obsession, who she would be photographing, was still 20 minutes away. And so she was struck by this vast number of brides posing for photos – what she would later discover was one of up to seven backdrop and location changes for the booming billion dollar industry of pre-wedding photography shoots. Move over Crazy Rich Asians, there's a new film in town exploring the real billionaires of the east. China Love explores the country's $80 billion wedding industry, and zooms in on the new trend of the pre-ceremony photo shoot which can set couples back half a million dollars. An Australian expat who has lived in China for four years, Martin-McGuire respectfully plays the role of an outsider looking in. What results is a fascinating film that ends up delving into Chinese history, culture and social customs. In the lead up to film’s launch in Australia, Kevin Hawkins chatted to filmmaker and photographer Olivia Martin-McGuire about China Love, her storytelling process and being an Australian in China. The billionaire who helps real-life Crazy Rich Asians splash out $500,000 on lavish ‘pre-wedding’ photos. ALLEN Shi went from nothing to a self-made billionaire in less than eight years, all thanks to this insane trend. “I want to have wedding photos underwater,” comes the unexpected request from a bride-to-be. It sounds like a dream, but for China’s ‘Godfather of the pre-wedding photo industry’, it’s not only achievable, but something thousands of brides, not just a stereotyped bridezilla, are willing to pay a lot of money for. From the comfort of Australia it’s easy to roll our eyes about some of the peculiar habits of those living elsewhere in the world. China’s unusual obsession with pre-wedding photography, the practice where almost-married couples dress up for elaborate photoshoots in fantastical settings, is seemingly perfect fodder for our amusement. But director Olivia Martin McGuire’s documentary does not exist to poke fun at this unlikely cultural phenomenon; rather she reserves judgement and uses this novel topic as a starting point to produce a thought-provoking and nuanced piece of journalism about many interesting facets of modern China. 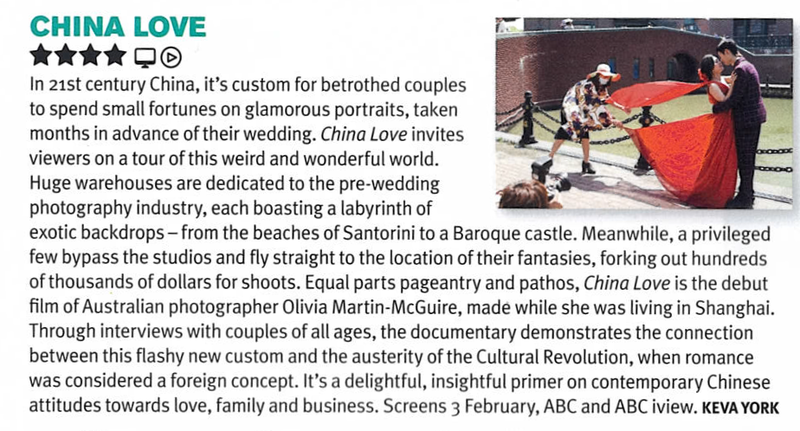 Australian filmmakers Olivia Martin-McGuire and Producer Rebecca Barry, follow the families of young clientele who take part in the hugely popular ‘Pre-Wedding’ photographic industry in China. If you’ve ever travelled to the world’s most famous locations and seen Chinese bridal couples posing for over-the-top photo shoots, there’s no need to congratulate them yet for their Big Day. Why? Because often the actual wedding could still be another six months away! 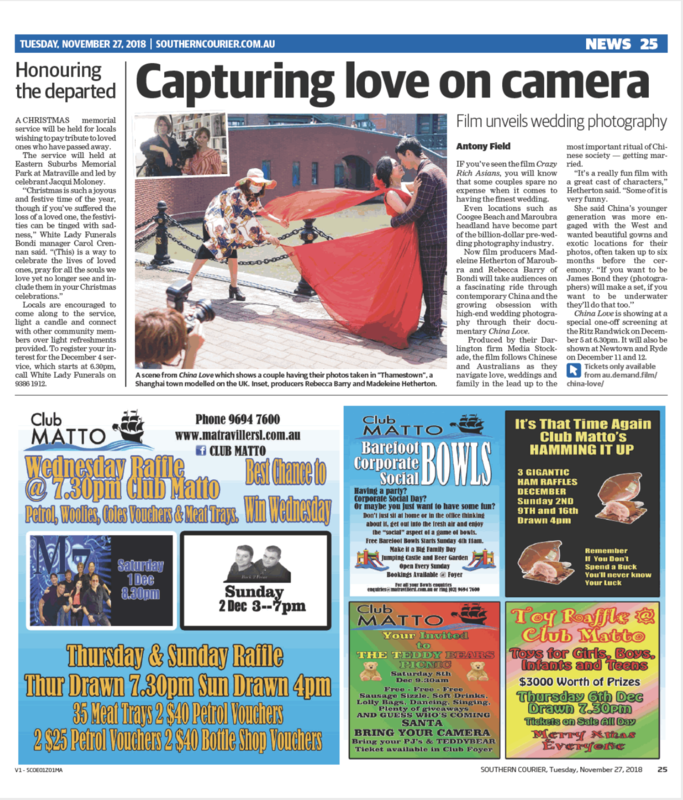 Chinese wedding photo guru Allen Shi says Aussie couples should get pictures before their big day. FORGET the traditional wedding day pictures, we should be copying the Chinese and organising the photographic shoot six months or a year ahead of the ceremony. Her documentary China Love, set in and around Shanghai, explores how “the future is living together with the past” in modern China through a look at China’s burgeoning wedding industry. This industry – now worth over 80 billion dollars – is deeply emblematic of the cultural change, and it’s through this lens that Martin-McGuire uncovers some of the challenges facing modern Chinese society. Australian photographer Olivia Martin-McGuire first caught sight of China's legion of brides-on-the-move, while she was waiting around on a shoot for AFR Weekend. I was working as a photojournalist and I arrived early for a job for The Australian Financial Review (AFR). I was actually shooting the director of Red Obsession in Shanghai at The Roosevelt Hotel on the Bund. I was taken aback by handfuls of bridal couples being photographed against the sandstone walls, and then picking up their dresses to reveal white sneakers and running to another wall to set up another photo.